Add 2 Stove Gap Caps to Cart, Get $1 Off each! Thanks for this nice product. It protects our wooden countertop well. Great solution to my "gap" problem. What a great way to bridge the gap between the stove and counter. I priced these at other places and this by far was the best value. When my 2 daughters were learning to cook, I would have to get the stove pulled out every week to clean the mess off the sides of it. With these, they stop those messes from going over the edge and down the side of the stove and counter. What a wonderful thing that everyone should have in their kitchen! This is a simple perfect solution to keep crumbs out of the cracks between stove and counter. Simple to use and you don't ever realize it's there. And so reasonably priced!! Magnetic strip became partly unglued from shield. Can easily be re-glued. I no longer have food get between counter and stove. Great product! I strongly recommend it! Brilliant Product. I ordered this in black and looks great in my kitchen. Does what it is designed to do! Durable, easy to clean,keeps crumbs from falling to floor betweeen stove and counter top. Much better than flexible rubber for same purpose. Will order an additional one for opposite side of stove. we had installed a new sink and dishwasher and this fit between the dishwasher and the range just perfectly. Though it wasn't as pictured u still really like it. Mine are flat and quite a bit wider than the smaller rounded ones in the picture. Glad you still havethese after all these years! I bought these Gap Caps" to replace 22 year old ones in my Mom's kitchen. You don't know what you miss until they break! Now, nothing falls down in between the stove and the countertops. When you're 88 years old, that can spell peace of mind. Bought mine from you & their the greatest. Food would constantly fall between the counter and the stove. It is finally comfort not to worry about the food between the gap. works like a gap cap should!! I had the problems others had: the magnet came off, the gap cap kept sliding around. After looking at it, it was clear the stove needed to be leveled to the level of the cabinet. Once that was complete and after I pressed the magnet back on, the Gap Cap worked very well. No regrets. Gap Caps are a great product! There was a problem in our new kitchen, there is a small gap between the stove and the adjoining counter tops, into which, smal amounts of debris could fall into this space. The strips stop this from occuring. I ordered the black spacers, and they matched perfectly with the stove. Our cleaning Lady saw them and has ordered a set for her own home. If you have gaps between your stove and countertop, you must buy this product! Attractive. Helpful in keeping the stove and countertop clean. Nothing negative in it's use. The product works just fine. Does what it's supposed to do--keeps food from falling between the stove and the counter. THIS IS THE BEST ONE I HAVE PURCHASED BECAUSE IT HAS A LONG MAGNET ON THE SIDE AND IT WORKS GOOD. This is the first time I got these. I had an old stove and it really was messed up from all the food fell on it. These stop those messes! I don't have to move the stove to clean up spills any more which is the best part about the Gap Cap. It is also attractive to use. I bought them for my mother also. Not much to say about a decorative piece of aluminum that keeps food from falli,g between stove and counter? This is exactly the color stove gap caps I was looking for and could not find anywhere else. They are a matte aluminum color and work like a charm. The product is a good quality, I was surprised to see the back had a magnet the whole length so it will bond with the stove. My mistake was, my stove is about an inch higher then the counter.They still work but hubby is going to be trying to lower the stove. This is a great product...matches my stove and cabnits to a tee...really glad i bought this item.. They do keep the space between stovetop and counter clean and stop spills from going down the sides of the stove. stove Gaps because I made eggs and while cracking the egg to put in the pan it came out of the shell and ran down between my stove & my cabinet. I think this is an excellent item as it does its job. Wipes off nicely also. It looks great and I no longer have to worry about food dropping down the sides. I love my gap cap! It's a great idea and a great product to have. It helps with cleanups by preventing food from getting in the crevices between the counter top and stove. I love it! Very attractive. Easy to clean. No more moving the stove to clean up boil overs. Have purchased these before for myself, family and friends. The magnets come loose over time, but it's a simple fix with some glue. Just fabulous for spills and crumbs. No more embarrassment when you have to pull stove out for service. Great product Helpls keep crumbs from going between stove and cabinet !! Make sure you order 2. You only get one when you order. Had to pay shipping on second one. Does not moved once installed!! Fills in the gaps between counter and stove. I like that the cap is staying put. Have used a gap cap for the sides of my stove for many years and couldn't be without them. In the past, they would slide forward, but these with the metal strip are really nice. I never have to worry about spills running down between the stove and counter tops. Gives me peace of mind knowing that no more crumbs will find their way between our stove and countertops! Because of the way our stove is placed in an older home, the gaps between it and the cabinets are wider than most. This fills the gap on each side better than others we have tried. I like closing this gap. However, the item does not quite lie flat on one side, when it is flat on the other. A Real Good Problem Solver! 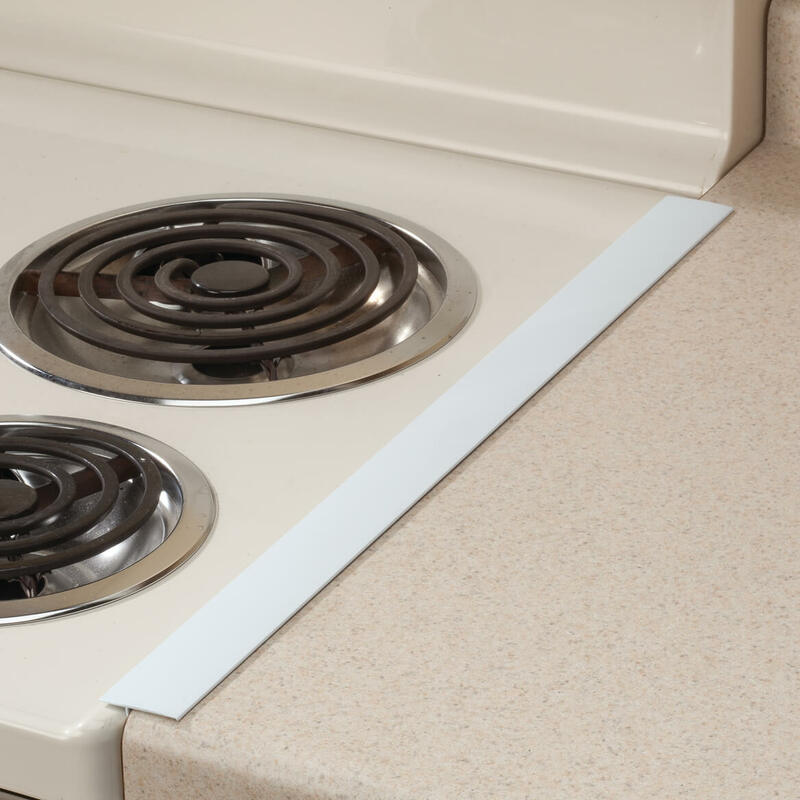 This is a great solution to keep food & crumbs out of that stove-counter gap. Just remember these are sold individually and not in pairs. A great fit, easy to clean, looks good, a good value. I've ordered them for any house I had that stove counter gap. The gaps on both sides are closed and no worries about items dropping between stove and cabinet. Fits perfectly between the fridge and counter. Exactly what I needed. It works really well as long as your cabinets are even with the stove mine was not but we was able to fix it so it would work fine. This was the only one I could find of this quality that was black to match my granite counters and black accents on white range and affordable! It's perfect! The perfect accessary for the stovetop. The perfect accessary to any kitchen. Very durable and easy to clean. I have used this item before. Keeps area clean between my stove and countertop. No messy residue down the sides. Bought for use in my Mom's kitchen. They match perfectly and she is delighted! fit tight. right color. hardly know its there. Such a simple solution to a messy problem! Wish I had gotten these long ago. We filled in the "gap"
I hang the cutest little measuring spoons on the wall next to my stove...no more dropping them between the wall and the stove...Yeah! We had gap cap covers for the stove in our former house. After 12 years of use they were still in great shape, but the color didn't match the new stove/kitchen so we bought new ones and left the old ones for the new owners to enjoy using! I love this to keep the food off the side of the stove and counter. Hated when things fell in between the two. You don't have to worry about food and dirt or water getting down beside the stove. Great for keeping food out from between wall and stove top. The gap cap does exactly what it's supposed to do! Close the gap, and the magnet is nice and strong. Great way to cover the gap between stove and counter. It also worked on the gap between my fridge and the counter. The magnetic side helps it stay in place. I like the black color, it matches my appliances. These fit so well and will keep the kitchen cleaner. I love this product because it keeps crumbs, grease and other debrise from getting between the stove and the cabinets on each side of it. Great product and looks great! I replaced the last one I bought from Miles Kimball after many years of use we needed a newer model. It is even better then the previous one. I love Miles Kimball products, never a complaint! These metal shields are far superior to any other materials. They are a must in my kitchen. I have been wanting one of these for ages. Finally after having to tear my cabinets out for a major kitchen repair and seeing all the gunk that had collected for years, I decided to end this problem for good. The strip fits perfectly, stays put and is easy to wipe clean. I love it. I just wish they made one to fit on the other side of my stove which is against the wall. Simple design but very functional. We were able to paint it to match our counter top. It now looks like an extension of the counter. This product is great! It is easy to clean, looks great, and stays where put. It prevents spills falling between my stove and counter. Protects between my stove and cupboard and it is amazing! its a great idea made by metal and not plastic, the other that I bought from other places are melted because of the hit. Very very good. I got these spill shields for my mother's kitchen, to be used between both sides of the stove. The color matches her stove perfectly. She really likes them alot, they just stick out a little bit at the ends. Otherwise, they help from splattering and spilling between the stove's sides. My stove and all my appliances are black so the black ones I orderd look so professional. I love them and they clean-up easily! where were these 20 years ago ?? I do a lot of canning, and anyone who does, will tell you it can get messy getting it from the kettle to the jar......my old stove looks like the dickens with dried tomatoes to jelly that slipped down the sides, and no way to take it out to clean it ! I LOVE these things, and plus, it hides a burn mark I made on the edge of my counter !! Highly recommend for daily use for any and every one ! I had these several years ago and thank goodness finally remembered where I bought them. Miles had the black color I needed where local places only had the aluminum. The stove gap caps are essential for the kitchen. Even small spills happen at one time or the other, and having this item will make clean-up a snap. When ordering, remember this does not come in a set, so two gap caps may be needed. Over a period of time, the magnets may need to be reinforced with a peel and stick magnet found in hardware stores. I had a large gap between my stove and counter and this took care of it just fine! No more items falling down the crack! Lays flat and I don't even notice it is there now. The black finish blends in with the stove. Just wipe and it is clean. What a simple great invention to keep those spills and crumbs from going down the crack between the stove and countertop! My husband was thrilled that I found these! They are the perfect size for our stove and the magnets keep them in place! Whenever you change appliances it seems that the new ones don't fit like the older ones and you always seem to have a space that collects crumbs. This keeps it easy to clean up. Very happy with purchase. Nice finish. This product is so great that I had two family members want them as gifts after they saw mine. No more pulling the stove out to clean drips down the side of the stove. Product is great and it is as described. Terrific product. Easy to use. Keeps the sides of the cabinets and stove clean and free of drips and spatter. I chose the color black which perfectly matched my built-in stove and granite countertop. It is made of metal so it should last indefinitely. It would be difficult to trim if it had to be made shorter but it could be done with a hacksaw. Such a needed item. You know everything is staying where it should. this is perfect especially in old kitchens where you're most likely to have gaps between the stove and sink or countertop. Perfect fit and easy to clean. Gaps btwn stove & countertop. Nothing falls between while cooking. "I will tell all my friends"
This stove counter gap cover blends very good with my kitchen design. We are canners - we use our stove mostly for jellies and jams. And there are spills down the sides between the stove and the counters. These strips will prevent the drips. Wonderful and useful ! Perfect - just what I wanted!! Fits perfectly to fill the gap between the stove & counter. Love that is it magnetic & glossy black to match my kitchen decor. I already had a pair. My mom liked them so i ordered a pair for her. They are used to prevent food from dropping off the stove to the gaps on the side of the stove. For this function, they work well. color is an excellent match to the stove top. I bought these for our new electric flat top range and loved them. They lasted about a year before the magnetic strip began to separate from the strips. I am ordering two additional. the concept was a good idea but it didn't fit. I needed the bar to be closer to the end. But it was still a good product. My family loves all these things, Thank you a lot ! My mom has used them for years,And when she asked me to order them for her I ordered myself a set and they are so nice. I love this product......I bought one and forgot to purchase two of them. Ordered the second one, I am happy now! When I accidentally spill, the guard does not allow it to go in-between the stove and counter! They work great for that!!!!!!!! I Would recommend them. Not sure if they are for everyone, but they work for me! I've been using this product for years. Prevents spills & messes. Easy to clean. I DEFENTLLY WOULD BUY THIS ITEM AGAIN.. THIS IS MADE OF QUALITY MATERIAL. I BOUGHT THIS ONE TO REPLACE THE ONE I HAD BEFORE. THE OTHER ONE WAS MADE OUT OF A PLASTIC MATERIAL. I love to cook, but, I don't like the cleanup part so these come in handy, they really keep messes from happening. I don't have to try to stick a cloth on a knife anymore to get down between the stove and the counter to clean, this prevents anything from going spilling down and my stove looks neat and clean. Don't hesitate on this, buy it! Great having gap cap between my stove and counter keeps all foods and liquids from dropping into this space. I like the new colors so I can cordinate with my kitchen. Gap cap is easy to clean, never gets in my way of cooking. Now I don't have to worry about spills. Only change I would make with this product is to have the corners rounded so they are not so sharp. I plan to do this myself, not a big deal. Used to keep food & other cooking materials from falling between stove & counter. It is so nice not to have all those crumbs falling beside my stove. It fits perfectly, and doesn't move. Use on my stove. Perfect fit. No complaints. It is nice not to have to get to down to clean between the stove & baseboards to clean the floors & walls so often! & a rodents deterent as well by helping to keep any kitchen mess from falling between the cracks away. We live out in the country so these critters are a pest! Even if you live in an apartment this item is so helpful. I highly recommend this to anyone! The magnet strip on it helps keep it iplace & price is right too! The strips fit great and looks good besides serving the purpose that it is designed for. I've bought 6 pairs of these for myself and family. The aluminum ones are the best due to durability. Just wipe off if dirty, doesn't need to go in dishwasher. They've improved over time since there's now a magnetic strip on it to adhere to stove to prevent it from accidentally sliding off. I bought one 2 years ago and it still looks and works great so I bought 2 more. It stays in place it hasn't scratched yet and I cook and bake a lot. 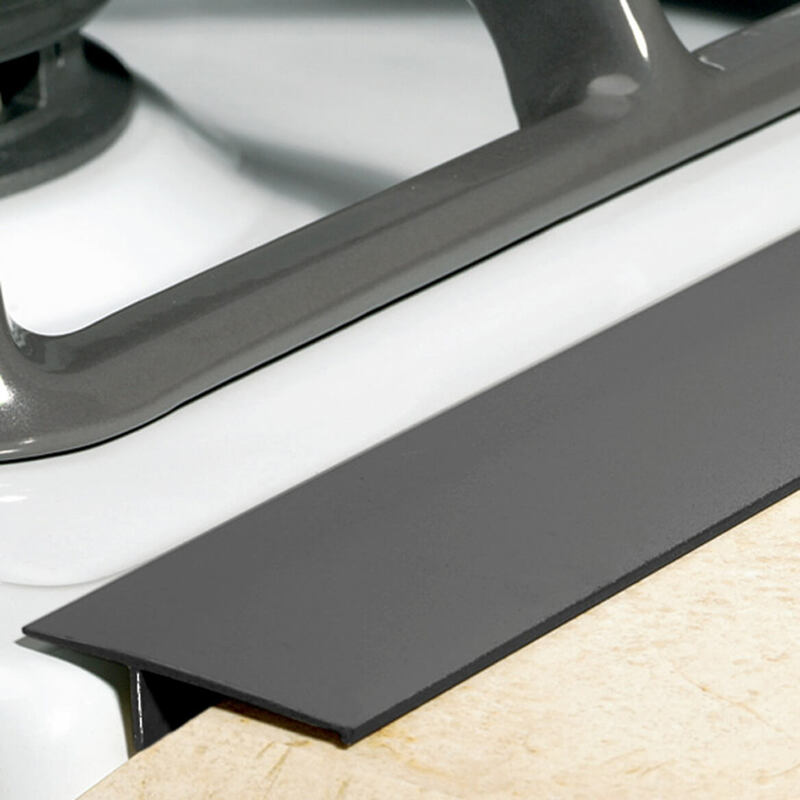 Apply magnetic back to stove top and rest on counter top. Make sure stove is close to wall for proper fit. This works perfectly to cover the side gaps between counter and stove. I'm so glad someone invented this product. works great --stays on--keeps out crumbs!!!! This is the second one I bought and I really like them. I had a gap between the counter and stove and I used to stuff a towel in between. Now it looks a little bit more professional. I would this as a gift also. Loved them, I really like how is matches and it is very helpful too. I think my stove is happy..
Love it, love it, love it. Took me a while to get this product as it was put on back order twice. However, the wait was well worth it. My countertops are dark and the range is all black and this blends in so well. I don't even notice that they are there and with the magnets they will not move at all. Gap Cap for stoves is pure genius! Wished I had thought to order 2! Only ordered 1. My old gap cap I got perhaps 20 years ago-- it was looking old and worn. So real glad to get a new one- I even bought an extra- but don't think I will live more than another 20 years- so will probably give to a friend. works great for preventing food/liquids from getting in between stove and countertop. Helps keep clean-up of stove and countertop quick and easy. Just what the housekeeper ordered! Just pull out your freestanding range that has been used "avidly" and be shocked by the accumulation of debris that has collected and hardened. Then, after cleaning and adding the gap cap, surprise yourself with a much cleaner kitchen. Hidden odors are gone, dried debris eliminated and all done at a nominal cost. Pulling out a stove and having to clean the "oozovers" down the sides of it and the cabinets is not a pleasure....this item really lessens the chore list. The edge of our stove is about 1/4" higher than the counter-top is. Consequently this did not fit and had to be returned. We will keep watching for one that might fit -- hate it when I spill something between the stove and countertop! Magnetic strip holds it in place well for cooking and clean-up. Only drawback is the white color is whiter than standard white appliances. I'm always spilling something on the counter or stove top and it always finds its way into the gap between the cabinet and stove. This will help keep the gap cleaner and I won't have to move my stove as often to clean up my mess. Only problem is the magnet does not stay on when I move it to clean off the stove. I have to put it back on every time. Great product but shipped in a plastic bag. These gap caps are a great addition to any kitchen. They are simple to use and serve the purpose they were designed for. Sometimes the quality isn't top notch as you can visibly see the surface imperfections but mostly they are good to go. does the trick. but if you are not careful when wiping it to clean it will slide and the sticky part will come off. if it comes off then the spacer product will not stay in place. but i did like it well enough that i bought another one. i am just more careful how i clean it. My daughter ordered the gap caps and I liked them so I had to get a set. Thanks, they work nicely and match my stove perfectly. I have had this product from someplace else and it was not metal. I highly recommend that you get the metal. It is sturdier and will last longer than the silicone or plastic. It keeps crumbs from going in between the stove and the counter top. Magnets wont stick to my stove, so it is not as stable as it should be. Looks nice with granite countertop, though. Had tried the silicone version, which worked nicely and was wider, but its white-ish look didn't go with my countertop as well as the silver colored one. I bought this for my daughter-in-law, as she had gaps between counter & stove. She said it is terrific - stops those crumbs and spills from going in between. I bought these for my mother (in black) she has a black countertop and a black stove. The gap covers blended in well. They clean up easily with Windex or any other cleaner. Not sure if they are dishwasher safe. They are not as long as I expected them to be, they were about 2" shorter than the length of the stove, but they work for the price. They are great, just the wrong color,. Black would have been prefered. thought I ordered silver, got white. I used to have to pull out the stove once a month, to clean up the spills. This product prevents those spills. It is easier to clean than pulling out the stove. Saves you time cleaning up spills between the stove gaps and cabinets. Stoves usually come with adjustable legs, that you should have to level your oven or make them cabinet height, adjust them to level the height of the oven. Aside from that the magnet disconnected quickly but I re-glued them on and they are fine now. I just think this is something I didn't know I needed but now I am really glad I have them. I use this product to keep spills from running down the sides of my stoves (avid, not TIDY, cook). Works great for that purpose. After it got some crumbs on the magnetic, it was less effective because it was hard to get them off. I'm just ordering another pair, as the old ones worked enough to be worth the small price. great sale price on this. It works great. Already prevented several messes from spilling over into an area that would be very hard to clean. Awesome product, but the magnets could be stronger so it stays in place better when wiping off the counter around that area. This great it really fits well between my stove and cabinets,keeps food from falling down in the cracks by my stove.I just love this.I will buy one of these for all my family members. Small enough to not stick out. Looks great with my black ceramic stove and black granite counter-top. Does what it supposed to do, keep food out of the gap. I would give it 5 stars, but the glue holding the magnet on to the aluminum does not hold well. use when frying contains flour to counter top. Keeping out drips between counter and stove. I've purchased similar products in the past, and all of them have been plastic stove guards. I like the medal-like material of this product because it is more sturdy, doesn't move around like the plastic ones do, and it's easier to clean (not to mention there's no risk of burning/melting it). What I needed for the gap between the sides of the stove top and counter top. But the magnetic strip will still slide at times. Disappointed in the color. I have a bisque colored stove, and the beige is way too dark. This does exactly what it's advertised to do. It covers the space between the stove and counter. It fits perfectly, doesn't need to be adjusted, doesn't move around or wiggle out of place. It looks nice, but really isn't that noticeable. I'm happy because I'll not be cleaning down the sides of my counter and stove or the floor around them any more. Thanks! Even though my stove is little higher than my counter this still does a great job of keeping stuff from falling in between. The gap cap works very well. The first one I received was badly twisted and the magnet would not attach. The company sent a new one at no charge, and I am very pleased. Works just as described. I bought the black one and it's a pretty, shiny black. Fits stove well. Make sure to to try both sides for best fit. Includes 2. No magnet needed. Good value. Super fast delivery. This thing is pretty cool to help avoid getting junk stuck between your counter and your stove. It easily comes off though but it serves its purpose. I previously had a similar product but it had no magnet and was made of white plastic which inevitably got the edge melted a time or two. This gap cover is made of metal so I'm expecting it will stay looking like new much longer. I do think the color is more on the harvest gold side than beige so it didn't match my almond stove exactly, but that's not that important. I picked the gap cap up to check the color just now and the magnetic strip came half off the gap cap, something I wasn't expecting. I would have thought it would be attached with some sort of cement or strong glue. Bottom line, it covers the gap between my stove and counter adequately and stays in place fairly well. Protects food from falling between stove and cupboards. These are great for keeping food from falling between the "cracks". The only down side is they are not fire resistant and you do have to be careful not to have a pan get too close. It do keep things from running down side of stove. Better than the old plastic ones. These were used to replace our old plastic ones that were OK until a hot pan was put on them and they warped. Being of metal that is no longer a problem and should last a long time. However, wish there was a larger selection of different colors. It does a good job of keeping spills from running down the side of the stove and cabinet but I was disappointed in the color. Aluminum is not white or pale gray. I have had a set in aluminum color. Does a great job keeping the crumbs and spills from falling on the floor. The only bad part is, the magnet which holds it on isn't terribly strong. So, when you're cleaning, be gentle. Otherwise a helpful product! Gap Cap is keeping things cleaner! but it took out the symbols. Fit well between my stove and counter. Was pleased, no more crumbs and etc. fall betwen the spaces. This product is great to keep spills or splattered grease from getting on the sides of your stove which is hard to clean without moving the stove out. I had only ordered one and thought I should have ordered two. I ordered another one and it wasn't packaged very well. Came in a plastic bag and was bent. My husband was able to straighten it out. Anna Packed it, not a good job. Needed to be put in a narrow cardboard box, so it wouldn't get bent. 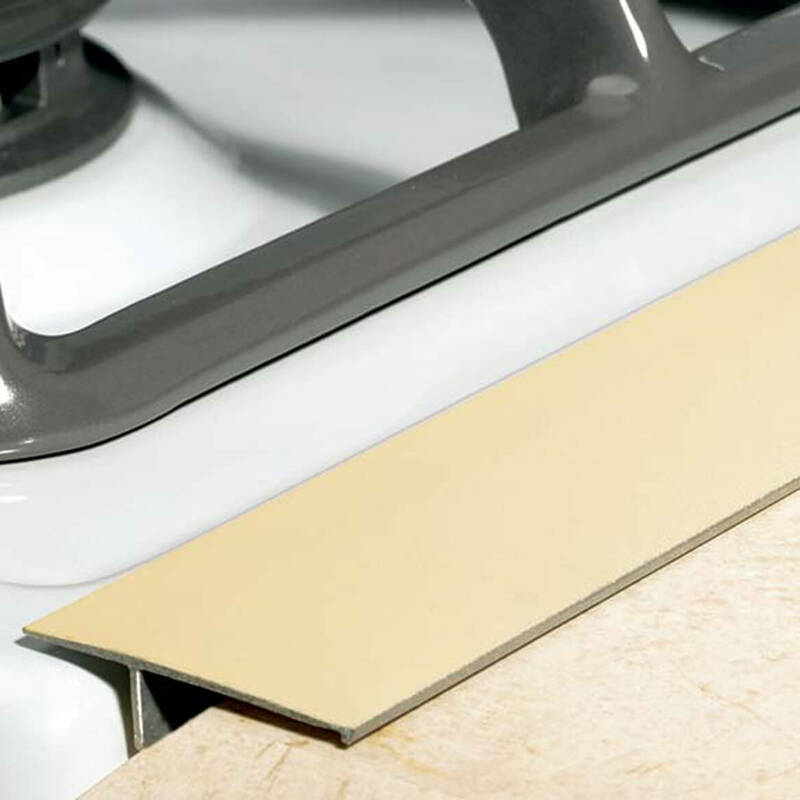 Gives great coverage over the gap between stove and counter. Magnet runs the entire length so stays in place much better than other products. The included magnetic strips don't cause the strips to cling as well as I had hoped, but the devices do help catch side drips. This item does what it's suppose to do...keeps spills from going between my stove and dishwasher. This is my 2nd order for these. I use the gap caps between my stove and counter tops. They keep spills from running down between the stove and cabinets, saving much difficult cleaning time. Bought 1 before to see how good it was; decided to buy another to trap food, etc. from falling into open areas between stove and counter. Works well. Washes well. Fits well. Occasionally, I'll move it out of place, but no problem as I put it right back. The reason I gave this 4 stars is because part of the magnet fell off the gap cap already. Cute design. Helps give the kitchen a more polished, finished look. I like that it covers the crack that was between the stove and counter. It works just as I had hoped. Glad for the magnet; I think it helps (some others don't have that feature). Just alttle to long, but works well! Finally, no more messes to TRY & clean! I bought this gap cap for my step-mother for Christmas and she finally started using it a month ago. She's very happy with it and I'm even happier because I'm the one that helps with detailed cleaning. It's a snap to clean and no more drips or crumbs to try and find to clean up. I've been looking for something to cover the gap between counter & stove but didn't like the plastic ones I found. 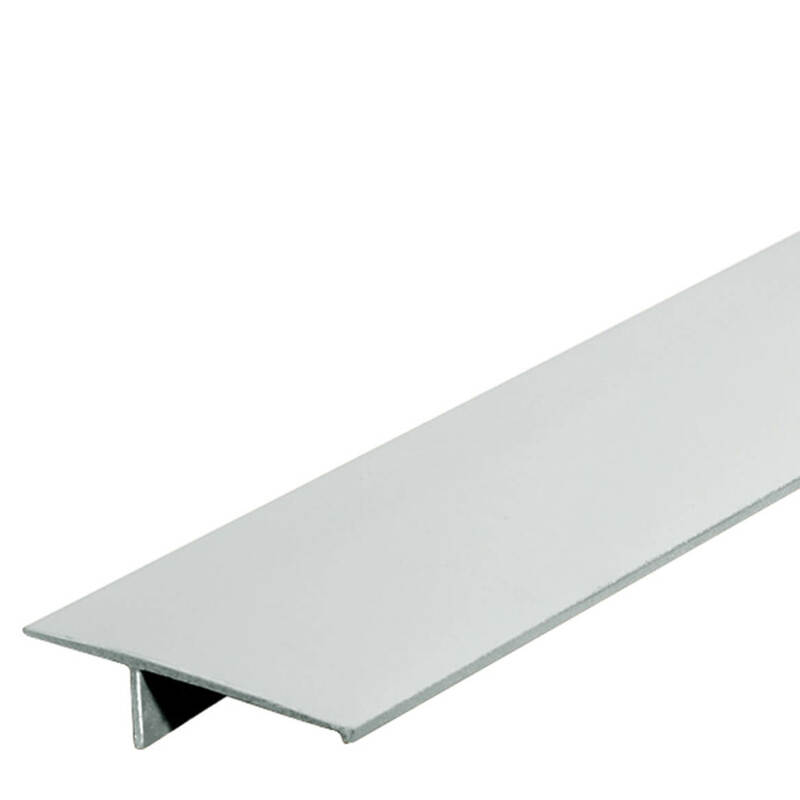 I like that this one is metal & thin, simple, stable and easy to clean. Matches the white stove well. Only wish the magnet would be located on the narrow metal strip between the stove & counter, instead of under the flap over the stove, to avoid the magnet gap. Otherwise it serves its purpose very well. It works, however, the magnetic strip does not stay on the product. I'm going to try to use some glue to make it stay in place.